One of the best things about home cooking is that your entire kitchen/house/apartment fills with the wonderful aromas of tasty recipes, like applesauce. It’s an incredibly simple thing to make. So simple I remember making it as part of a class project in early elementary school, but its also one of those scents that makes a house feel like a home. Perhaps its one of those American cultural things like apple pie. Anyway, being fall it is the season of apples and in a pretty agricultural area apples are available in an abundance of varieties at Farmer’s market. 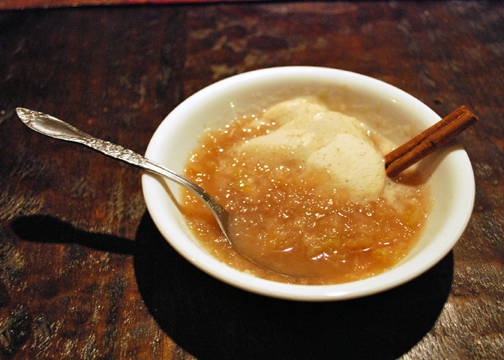 While there are some common supermarket varieties of apples to be found there I usually get drawn to try the new and different ones instead, so for my applesauce I primarily used Snow apples with a couple of Empires thrown in. Snow apples are a softer apple and so more suited to applesauce making than the more crisp Empire apples are, but a little variety doesn’t hurt. I do not peel my apples, but that is a matter of preference on your part. 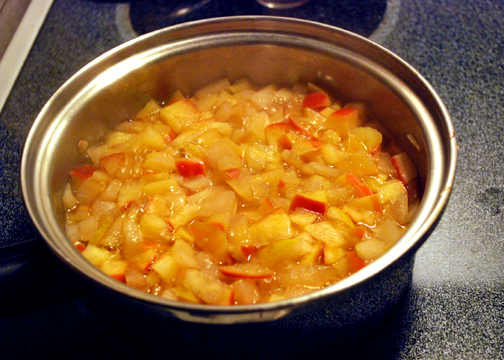 Pour water and diced apples into a saucepan and put over medium/high heat on the stove top. Cook for approx. 10 minutes. Turn the heat down to low. 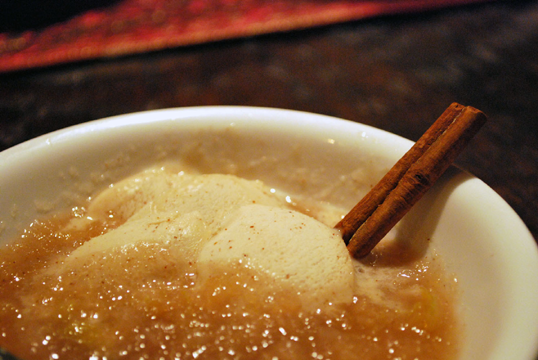 Mix in cinnamon, cloves, vanilla and wine. Simmer for 30 minutes. Remove from heat and mash. I use a potato masher for two reasons. 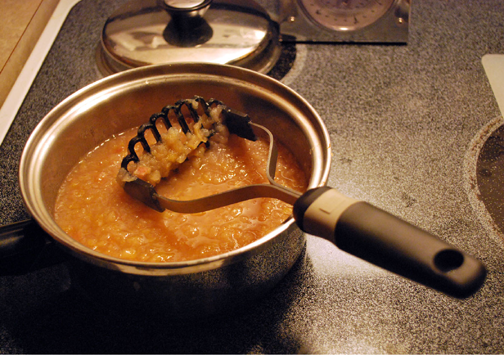 1) I like the more chunky texture of homemade applesauce. 2) I am lazy and would rather wash one potato masher than have to clean my entire food processor for something that take about 2 minutes. *I used Terre di Futi, which is a blended vernaccia (white). Very fruity. It was what was in my fridge and, of course, the alcohol cooks out.